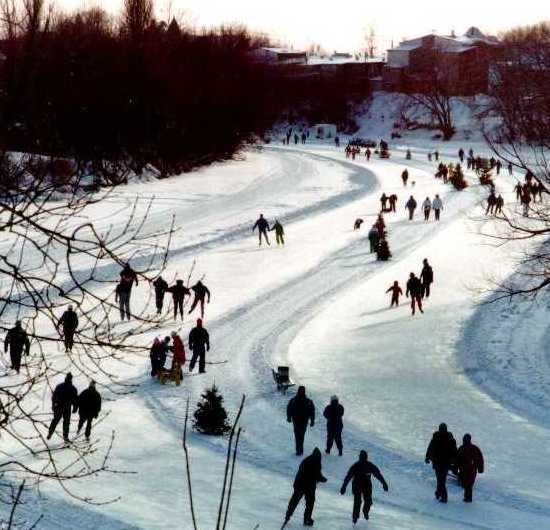 This is Québec's longest skating rink. Two parallel tracks of 4 kilometers each are linked together at the ends, creating a continuous 8.3-kilometer loop snaking through the center of Joliette. 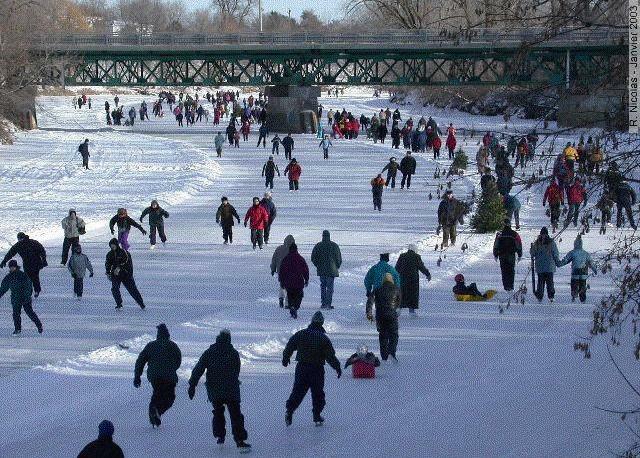 Joliette's winter carnival, Festi-Glace, brings 30,000 people to the river for two weekends in a row at the end of January and the beginning of February. On a quiet day, there's plenty of room to spread out. The snow-covered median strip is dotted with Christmas trees and benches to rest on. There's a snack bar on the ice in case you get hungry. 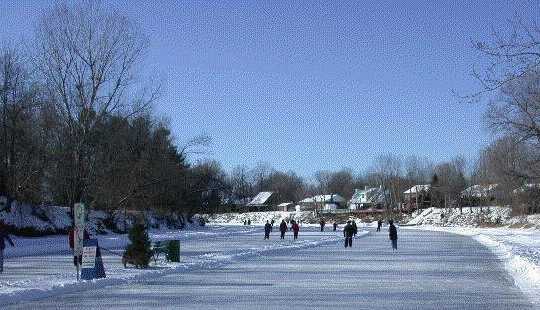 The river's high steep banks shield the skating track from cold winter winds. Seven river access points offer free parking and heated shelters, including the brand-new skaters' pavilion in the Parc Louis-Querbes. Another popular starting point is Restaurant Henri, located just north of downtown on Joliette's main street (a continuation of Autoroute 31). 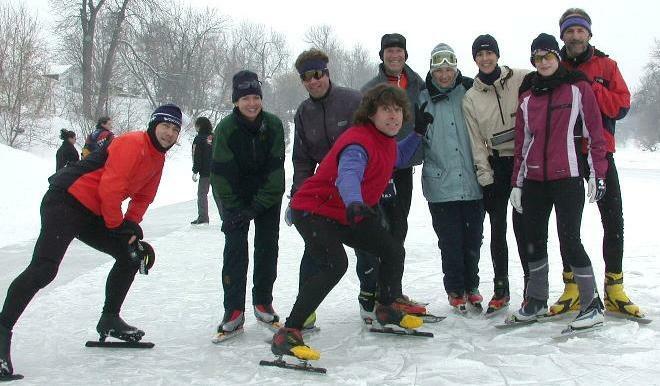 Joliette is a favorite weekend destination for Nordic skaters and speedskaters. English: From Montréal, follow Autoroute 40 East. Take Exit 122 onto Autoroute 31 North. Follow 15 km into Joliette. At the stop sign, go straight and get in the right lane. After you pass the Cégep, cathedral and noviciate, turn right on rue Fabre and follow to the end. You'll see the Pavilion in front of you on the riverbank. Francais: En provenance de l'autoroute 40 Prendre la sortie 122 (direction Joliette), vous serez alors sur l'autoroute 31 Nord. Vous ferez environ 15 km avant votre arriv�e dans la Ville de Joliette. A votre arrivée dans Joliette, vous ferez un arrêt. Continuez tout droit en GARDANT la voie de droite. Vous passerez successivement devant le Cégep de Lanaudière, la Cathédrale de Joliette et le noviciat des Clercs de Saint-Viateur. Immédiatement après les Clercs de Saint-Viateur, tournez à droite sur la rue Fabre. Au bout complètement de la rue, vous verrez le Pavillon de la rivière sur le bord de la rivière L'Assomption.